Do you have any idea how hard it is to write your own introduction? Seriously, this is entirely too difficult and even a bit unsettling. I guess we should just start with the basics and keep it short. I'm Grace McDunnough and I am pleased and honored to have joined the Koinup team. 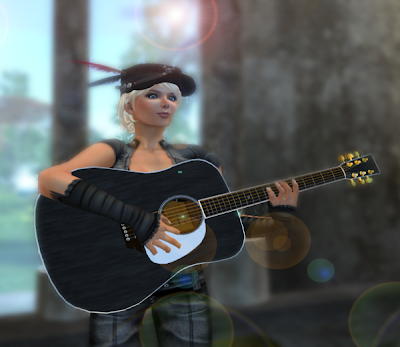 That's me there performing live at my cafe on Nevi in Second Life. You might call me a wandering minstrel; I'm a live musician in Second Life and a member of the ground-breaking virtual world live music tour called "Rocking the Metaverse" presented by Koinup. Here I'm unofficially in charge of sass, and officially charged with writing stories about the magic of music in virtual worlds, affectionately labeled Grace's Liner Notes. Liner notes are a wondrous mix of music inspired art, words and untold stories, and that's exactly what I hope to bring you here. I'll also share tips and insights about live music in general - from being a performer to hosting your own venue. When I'm not performing, I spend most of my time exploring Second Life and other virtual worlds. I'm always open to story ideas so please drop me a comment here or email me if you have a euphony scoop to share. Welcome to Koinup Grace - great to have you with us ! Grace, you're my favorite kind of person: the webiquitous. Best of luck for this column! I'll gladly follow the liner notes and hope to see you soon in the 'verse. @poid and @pier Thank you both! Lovely to see you here Grace and what a great photo!